Longmont Artist Joan Doll, once a print designer at Anthropologie, has combined her personal style with a background in textiles to create Coarse Cloth, a luxury handbag company that makes beautiful bags with all-natural Italian yarn. What draws people to your bags? Women love unique bags. 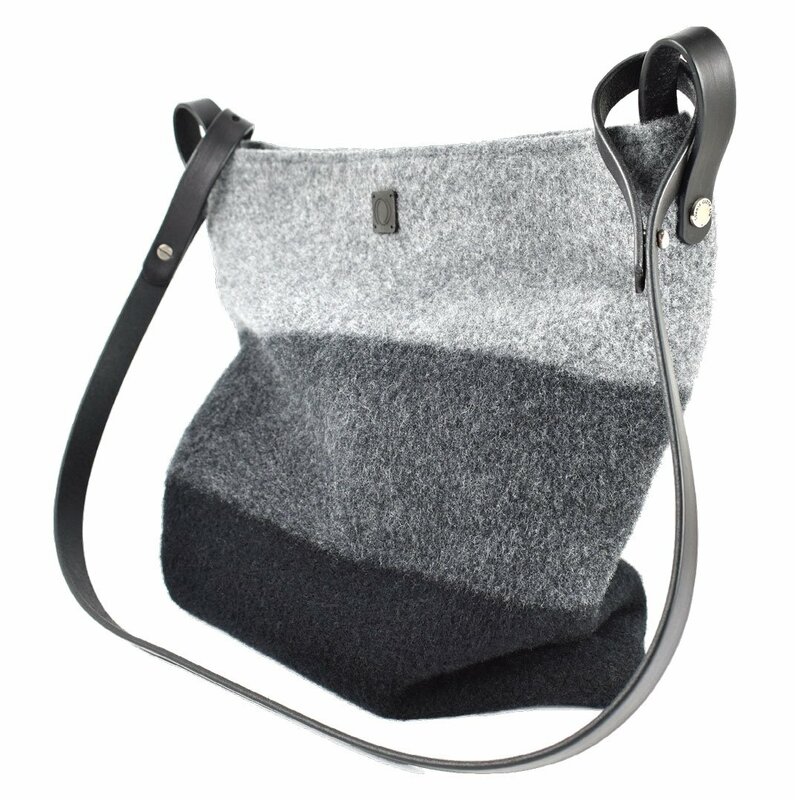 These bags look different because they’re seamless—they’re knitted, crocheted, and then felted on the outside, which makes them incredibly soft and fuzzy. The company’s name is Coarse Cloth, but you come and touch one of these bags and you can’t believe how soft it is. I work with a Longmont company called Icebox Knitting to source this wonderful yarn from Italy, which is the best yarn I’ve ever seen. It’s such high quality and it works so well for felting. I probably couldn’t get a better yarn produced anywhere in the U.S. The reason I chose the name Coarse Cloth is that coarse also means thick, and natural fibers are thicker than manmade synthetic fibers. All of our bags use natural fiber, so “coarse” makes sense. Do your bags look and feel different from other products on the market? Oh, yes. These bags just melt into you. You can wear our flat bags next to your hip and they fold around you seamlessly. We also have bags with flat bottoms, and those have lots of aesthetic appeal, too. You set them down and they have a slight cowl neck—they slouch a little bit. Those are very popular. Women like to see the folds in the fabric, the way the bags drape and reflect light. You offer bespoke bags as well. Have any customer requests inspired new design? Absolutely. A woman approached us at a show last summer and said she loved our Compass bag, but she wanted it in a bigger size, so we made it for her. When I started doing bespoke, it was mostly colors and strap lengths that varied. I wasn’t intending to make completely new designs. But this woman had a very specific request, and after seeing the result, I knew we needed to make more. It ended up working so beautifully as a larger bag. Do you have plans to grow the company? I founded the company in 2015 after taking entrepreneurship classes at the Colorado Small Business Development Center, but we didn’t start testing the market until a year ago. When we did start bringing our products to art shows, they sold incredibly well. So yes, I’m planning for a lot of growth. That said, ours are very high-end bags, and they’re unique, so they have to be in the right market to sell. Taking that into consideration, I think we have a slight advantage because we’re working with a unique fabric that nobody else is working with—at least not commercially.